The following post is from a revised version of A Report on the Old Colony Railroad Freight House (1887) which I prepared for the Washburn Site Reuse Committee in March, 2006, detailing the history of the former Old Colony Railroad Freight House located on Station Street in Middleborough. The freight house is presently owned by the Town of Middleborough. While some may view the Old Colony Freight House as simply an abandoned and decaying building, the structure is an important cultural resource which speaks to the town's as well as the region's transportation past, and it is listed as a contributing resource within the Downtown Middleborough National Register Historic District. The Freight House's architectural significance (as a building designed by noted regional architect Earl E. Rider and as a relatively intact surviving in situ example of a Victorian wood-frame freight house) and historical significance (as a reminder of Middleborough's economic past and the sole extant unaltered structure related to the town's railroading past) prompted the inclusion of the freight house in the Downtown Middleborough National Register Historic District. The structure still awaits restoration. While Middleborough's early role as an important railroad junction is often recognized, what is not sometimes realized is that three separate railroad companies were responsible for this development: the Fall River Railroad (1846), the Cape Cod Branch Railroad (1848), and the Middleboro & Taunton Railroad (1856). The location at Middleborough center of three individual railroads operating contemporaneously, each with their attendant depots, freight houses, rail lines and subsidiary structures, created a confusing nexus of tracks and buildings, and competing services. The original freight houses for each of these three railroads were located on the west side of the railroad tracks along Vine Street, a not particularly thoughtful situation since nearly all the freight passing through these buildings either originated from or was destined for Middleborough center - on the opposite (east) side of the tracks. Walling’s 1855 map of Middleborough clearly shows the situation of the Middleborough “Freight Station” located between the Old Colony line and that of the Middleborough and Taunton just southeast of the intersection of Vine and May Streets. In 1859, the inconvenience of this arrangement was eliminated when the railroads' freight buildings were relocated to the east side of the tracks, thereby obviating the need for freight-laden wagons to continually cross the tracks in a ceaseless parade. Middleborough’s early railroad freight situation was also deficient for other reasons, particularly the express freight as described in the pages of the Namasket Gazette in January, 1854. Mr. Washburn, the carrier of express freight in this village, says a considerable portion of the time, the evening train from Boston, and the one by which the most express freight is expected here, does not make the stop here necessary for delivering parcels from the cars. Consequently, he runs alongside the train, catching such bundles [as] are tossed out to him, dropping them on the ground, and catching more, until the train has arrived at a speed which he can keep pace with no longer, when perhaps half the packages intended for this place are still in the express car. The next morning they may be brought back from Fall River, perhaps. The conductor of the train accommodates as well as he can: but a sense of the danger he will be in from the approaching steamboat train, impels him to the necessity of driving on. One positive development during this era, however, was the development of sidings for those enterprises located directly adjacent to the tracks. During the summer of 1863, a side track was constructed to I. H. Harlow & Company’s steam mill located nearly opposite the depot on Vine Street, and the possibility of similar arrangements would continue to attract industrial enterprises to the immediate neighborhood throughout the remainder of the century. Though initially supported by local business concerns as a welcome incentive for economic growth, the unnecessary and inconvenient duplication of railroad services offered by three competing railroads (and their higgledy-piggledy arrangement at the Middleborough rail yard) was later regarded with dissatisfaction. 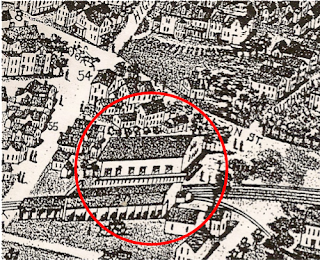 By 1867, the Middleboro Gazette was advocating the establishment of a union depot to house the three roads under one roof. Though this never materialized, consolidation did come (though perhaps not as expected) as each of the three railroads was absorbed into the Old Colony system, a process completed by 1874. Under the direction of the Old Colony, proposals for the redevelopment of the entire Middleborough rail yard were implemented in the latter half of the 1880s. A new brick depot was built and opened in July, 1887, and a 50,000 gallon water tank for "outward" trains was erected at the south end of the yard. The grounds were landscaped to create an inviting, park-like atmosphere. At this time, as well, the existing freight facilities were upgraded and the present freight house between Station and Cambridge Streets was built, being completed in June, 1887, with reminders of the old rail yard being removed. The old freight house dating from the mid-1850s was purchased by Eugene P. LeBaron of Middleborough and dismantled, and its site utilized for the construction of a newer, larger freight facility. The Old Colony’s new Middleborough freight depot was constructed in 1887 - not 1886 as is usually stated. In its issue of May 5, 1887, the Plymouth Old Colony Memorial reported: "Last Thursday the ground was staked for Middleboro's new freight depot. The building will be 156 x 35 feet with a platform ten feet wide facing the tracks. It will be placed near the site of the present freight house." The freight house, a long rectangularly-shaped and cavernous building, with a long overhanging eave on its west side (which created a canopy over the freight platform), was designed by Earl E. Rider of Middleborough. Rider was a noted architect for the Old Colony Railroad, who, by 1876, had designed over one hundred depots for that company. In the years between 1876 and construction of the freight depot in 1887, Rider continued to design both passenger and freight depots for the Old Colony, in addition to other projects. The mansard-roofed residence which he built for himself still stands on Elm Street near the Middleborough rail yard. Freight House in contrast to other freight depots of the era is indicative of the level of freighting which occurred at Middleborough Center. In 1904, the freight house was valued for tax purposes at $4,000, a further indication of the building’s substantial nature in handling the bulk of the community’s freight. Unless a company operated its own rail siding, its freight business passed through the freight house where it would be handled by the freight agent who was responsible for arranging its delivery. While some Middleborough companies such as W. M. Haskins & Company, J. K. & B. Sears & Company, and J. L. Jenney on Vine Street, and the George E. Keith and C. P. Washburn Companies on Cambridge Street were able to construct sidings to accommodate their shipping needs, all others had to make use of the Old Colony Freight House for the shipment and receipt of their goods. Consequently, large quantities of raw wool, leather, straw, cranberries, shoes, straw hats, lumber, boxes, woolen cloth and other materials, manufactured goods and produce continually flowed through the building. Agricultural goods shipped through the Middleborough freight house included produce ranging from cranberries, to milk, to garden crops and it frequently warranted additional freight cars. In 1888, the Old Colony was compelled to add a so-called “potato train as one of the night freights. It is loaded principally at Middleboro, Portsmouth and Tiverton.” Raw fluid milk was also an increasingly important item shipped through Middleborough. In 1876, Middleborough and Lakeville farmers began "exporting" raw milk to Boston, and by January, 1877, they were shipping 800 quarts daily into the Boston market, sealed in 8 quart cans. During the mid-1880s, the Old Colony Milk Producers Association, successor to the Middleboro and Lakeville Milk Association, oversaw the incipient growth of local dairying and the consequent increase in milk shipments, sending some 38,361 cans of milk to Boston alone for the year ending October 1, 1883. However, by in large the most important agricultural crop shipped on the Old Colony from Middleborough was each autumn’s shipment of cranberries. Bumper crops could effectively tie up freight operations at the depot for weeks. The expansive residential growth of Middleborough center during this same period further facilitated the freight business as commercial enterprise expanded and consumerism increased. The vast majority of merchandise retailed in Middleborough’s stores was received through the Old Colony Freight House. Just a single firm, that of M. H. Cushing & Co. at Middleborough Four Corners, was stated to handle “two hundred carloads of merchandise” annually, all of which passed through the freight house. To coordinate the flow of freight through the Middleborough freight house, the Old Colony employed freight agents whose job was to expedite shipments as efficiently as possible. In 1889, two were engaged for Middleborough, Ira M. Thomas who resided on Center Street, and Ezra B. Ellis who lived on Southwick Street. Like many railroad employees at the time, both men lived within a short walk of their place of employment. To further aid with the flow of freight through Middleborough, Michael Cronan of Vine Street was engaged as yard master. Freighting was particularly heavy during the last years of the 19th century and the early years of the 20th, leading to considerable congestion in the Middleborough rail yard. Aggravating the freight situation was the fact that as an important rail junction, Middleborough had developed as a transfer point where goods from one train were transferred to other trains bound for different destinations, most frequently Cape Cod. “The transfer office … is much doing, as the smaller stations on the Cape ship mixed carloads of cranberries and other stuff which have to be sorted at the transfer station to make carload lots and then hurried to their destination.” While this task was earlier accomplished at the freight house, by the 1890s, a one story transfer station had been erected between the tracks immediately southwest of the 1887 depot to facilitate this process. The freight house remained for the receipt of goods designated for Middleborough as well as the shipment of goods and products originating there. Railroad freighting through Middleborough remained unhampered by the relatively high fares charged by the Old Colony and its successor, the New York, New Haven & Hartford which leased the Old Colony beginning March 1, 1893. Though freight rates continued to fall during the era, the New Haven’s were among the highest in the region, in contrast to its passenger rates. Whereas the average freight rate per ton-mile for the Boston & Albany was 87 cents and that for the Boston & Maine was $1.04, the New Haven’s was $1.42. Nonetheless, because of the virtual regional monopoly held by the New Haven, freight rates did not deter activity at the freight house which remained constant throughout the era, though with the occasional downturn. In fact, so steady was freight business in the Middleborough rail yard that problems of congestion eventually prompted calls for improvement in the community’s freight facilities during the first years of the new century. During July the local business jumped 30 per cent, and at present it is about 50 per cent greater than a year ago. The many cars of lumber arriving for new buildings, together with the brick conduits for the underground telephone construction, as well as regular goods, which have also increased, have kept the men on the jump…. With the cranberry shipments now coming on the yard will be still more congested. The freight congestion in the yard also demanded the appointment of a yard master to better coordinate the handling of freight so that “consignees may get better service.” For several years, Middleborough had been without such a yardmaster, and though a request was made for the appointment of one in 1906, the railroad did not act upon it for another year. Freight congestion on the tracks of the Middleborough yard frequently confined passenger traffic to but two lines passing through the yard, as was the case in 1907 when the Fall River and Plymouth trains were forced to share one line, and later again in 1909 and 1912, a development which had the potential for inconveniencing passengers and disrupting passenger traffic, a most important business for the New Haven. Additionally, conditions among freight handlers were such that in May, 1903 they went on strike, exacerbating the local situation and inconveniencing freight customers. "The strike of the freight handlers of the railroad has been felt by local marketmen and provision dealers, as much meat and perishable material has had to be forwarded by express, instead of freight, thereby entailing a considerable increase in expense. One marketman was taxed $5 for a consignment of meat that arrived by express, Thursday, when ordinarily the bill for its transportation would have been about one-tenth of that sum." Most seriously of all, however, the ever increasing number of freight trains passing through or idling in the Middleborough yard increased the likelihood of serious accidents. On November 5, 1906, one of the worst freight disasters to have occurred to date on the Middleborough line occurred at the station when an express freight drawn by two engines barreled into the up Cape local freight which was idling in the yard. 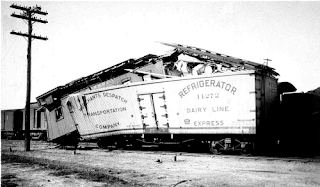 The first engine, number 610, of the express collided with such force with the rear of the local freight train that the caboose of the latter was forced into and virtually on top of the refrigerator car in front of it which was packed with cranberries. Following this incident, accidents involving freight trains became more frequent at Middleborough. Delays in moving the down Cape trains from Middleborough which were compelled to utilize the northbound track between Middleborough and Rock may have contributed to a second freight collision when a heavy freight train bound for Provincetown was struck by a small passenger train from Boston near the Middleborough yard in July, 1907. On June 19, 1908, an oil car attached to a freight train caught fire and exploded in the Middleborough yard, while “a coal car attached to an engine bumped a string of cars, demolishing one, and damaging three others badly”, on July 5, 1910. Additionally, the heaviness of freight trains could cause accidents as well. In October, 1910, the Fairhaven extra freight train was so heavily loaded that it was unable to get up a steep grade on its approach to the Middleborough rail yard. It became necessary to part it and double it into the yard, the rear section being left on the main line [about a mile south of the station] in charge of a flagman, while the forward end of the train was on its way to the Middleboro yard. While the rear section was on the main line, the light engine came bowling along the rails and smashed into the caboose [of the parked train} before the engineer could slow down…. The engine smashed through the caboose, reducing it to kindling wood and setting it on fire. Two large steel coal cars, just out of the shop at Sagamore, were also derailed and badly twisted…. The rails were somewhat warped because of the intense heat. Fortunately, there were few injuries in all these accidents. Freight remained heavy, and despite the spate of accidents and near accidents, it was not until September 14, 1907, that a yard master finally was appointed in the person of William Murphy to help regulate the passage of freight through the Middleborough yard. The Panic of August, 1907, however, brought with it a downturn in business and a consequent drop in freight traffic, so much so that a number of employees in the freight department were laid off at Middleborough in late January, 1908. Business, continued to remain light through the year, “especially the through western business”, and lay offs continued. 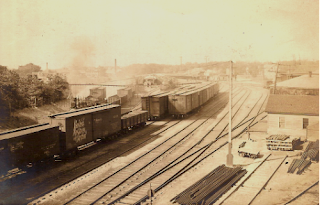 During the last years of the 1890s, New Haven Railroad officials had looked towards expanding Middleborough's freight facilities to better facilitate handling in the Middleborough yard. 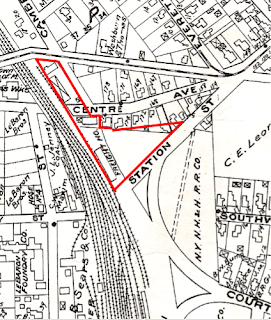 In January and early February, 1900, a survey was conducted in the vicinity of what was known as Depot Grove or Depot Park, the land now occupied by the local V. F. W. Post on the east side of Station Street. At the time the survey was undertaken, it was noted that "the need of a new transfer station has been felt for the past 5 years, the old building on the westerly side of the tracks proving inadequate to this constantly increasing portion of the freight business." Ultimately, the proposed plan called for Station and Courtland Streets to be closed to through traffic with a new street along the railroad's easternmost property line being constructed to connect the two, as well as creating an intersection with the western end of Southwick Street. The land to the west of this new street would be devoted to a new "mammoth" freight yard in the center of which would be located a new freight house. Among townspeople, "there was a sentiment that it would not be advisable to block the railroad company's large plans for making Middleboro one of its most important freight transfer centres in this section." In 1909, a proposal was mooted for improvements in the Middleborough rail yard, including substantial changes to the freight operation. While the public was drawn most to proposed changes in the alignment of Station Street which would have created a new more direct approach to the passenger station, as well as the proposed aesthetic enhancements to the immediate vicinity of the existing station, important changes were to be made to upgrade the existing freight facilities which pleased local users. Also problematic was the fact that Middleborough’s transfer business had outgrown the existing transfer station which was located southwest of the depot between the tracks. In 1903, a 103 by 20 foot addition had been constructed onto the easterly end of the transfer station "to accomodate three ordinary sized freight cars on each side" and in April, 1910, the transfer station was again increased in size, although only through means of a temporary expedient. “Two freight cars have been placed at each end and have been planked over to make more platform room to handle that big business.” The arrangement, however, was intended merely as a temporary expedient, as plans for a more permanent solution had been drafted by the New Haven. “The company contemplates the removal of their present freight house to a point nearer the passenger station, and the combination of the transfer and freight facilities. This is especially pleasing to the merchants, as it means not only more prompt freighting, but a more desirable location for hauling.” The transfer station was to be relocated just to the south of the freight house (“to make the handling of freight more expeditious”), replacing the derrick which stood on the site. Hopes for an improvement in Middleborough’s freight facilities lingered for a number of years, but ultimately nothing ever came of the plan which was apparently killed by the bureaucracy of the New Haven Railroad. In March, 1911, it was reported that “it is understood that the contract for moving the transfer station has been let to a Boston firm”, though the report acknowledged that the work had been expected to have been completed previously. When the town officials and the railroad company agreed that the plans were O. K. it was thought something soon would transpire, and that the road would have been finished long ago. But when the plans got out of town they were evidently lost. Some months ago, when a town official asked about them he was informed that they were in New Haven, awaiting the approval of some one higher up. Later the same official again asked about them, and he was advised that the contract had been let and that the job had been completed, and the railroad officials were much surprised when the town officer informed them that Middleboreans were still wading through the same puddles and mud banks in wet weather…. One change which was implemented, however, was the replacement of the existing rails between Middleborough and Campello in late November and early December 1910 with heavier steel rails in preparation for the railroad’s plan to run heavier trains over the line during the subsequent summer. The change does away with Middleboro as a terminal, both on freight and passenger trains. It does away with the engine house, transfer house, three yard crews, one freight crew and three passenger crews.... The work of the transfer house is now absorbed by the Plymouth, Brockton and Boston stations, and a traveling switcher from campello cares for the local yard work. Middleboro was one of the large terminals and the five lines merging here made it the logical junction for this section. from all that we are able to learn the New Haven railroad is not making a howling success of its new plan for cutting out the freight and transfer business from Middleboro. The fact is that Middleboro is a natural junction and so situated that it is very difficult to unmake it. Junctions like poets, are born, not made and unless the railroad is able to unhitch cape Cod and fit it on some other spot on the Atlantic coast, middleboro will still be a vantage point worth much consideration. The concern expressed by Wood was not merely a point of pride. By the New Haven's decision, some 100 plus employees based in Middleborough lost their jobs. By 1930, local freight traffic had dropped drastically, and in 1935 the New Haven filed for bankruptcy. Between 1934 and 1937, the former Plymouth & Middleboro line operated strictly as a branch line to North Carver to accommodate cranberry growers there, and in 1937 that branch was abandoned along with the line between Middleborough and Myricks. The Old Colony Freight House, however, itself had been abandoned for freight purposes a number of years earlier. With the decline of freight received through the railroad yard, and mounting financial difficulties for the Old Colony Division of the N. Y., N. H. & H., a decision was made to lease this building. As early as 1932, the C. P. Washburn Company occupied the building, utilizing it for the storage of “lime, cement, pipe & insulation” ancillary to its building supply business. In February, 1940, the railroad formally sold the property to the C. P. Washburn Company which utilized it for the following fifty plus years as part of its building supply business. Map of the Town of Middleborough, Plymouth County, Mass. (detail). H. F. Walling, 1855. 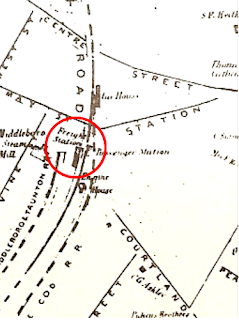 Walling’s 1855 map of Middleborough clearly shows the original freight station which stood on the west side of the Middleborough rail yard between 1848 and 1859 when a new freight house was raised east of the tracks. Middleborough, Plymouth County, Mass. (detail). New York: J. B. Beers & Co., 1874. 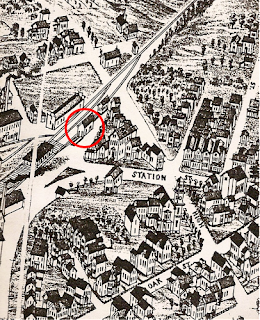 By 1874 when Beers & Company published a new map of Middleborough (a portion of which is shown above), the Middleborough freight facilities had been relocated to the east side of the tracks to a site near the one presently occupied by the Old Colony Freight House. The rapid growth of Middleborough as a rail center was clearly depicted in the nexus of tracks which formed the Middleborough rail yard, an outcome of the town’s position as an important transfer site. Middleboro, Mass. 1881. (detail) Framingham, MA: E. H. Bigelow, 1881. 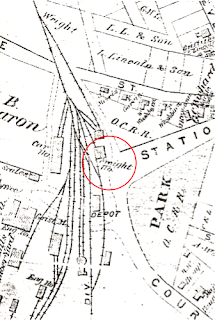 The sole extant visual record of the 1859 freight station which immediately preceded the 1887 Old Colony Freight House appears to be Bigelow’s 1881 pictorial map of Middleborough which shows a relatively small structure. Undoubtedly, the capacity of the building failed to keep pace with the community’s freight requirements. It was sold to Eugene P. LeBaron and replaced with the current structure. Old Colony Railroad Freight House, Middleborough, MA, photograph c. 1888. This is the earliest known view of the 1887 Old Colony Freight House taken sometime shortly after its construction. The building was designed by Earl E. Rider of Middleborough, architect for the Old Colony Railroad, as a simple gable-roofed structure with six bays on either side. The freight office was located in the south end of the building with windows facing the rail yard. Access to the freight platform was also from this end of the building. Here a team waits to offload its freight. The extension of the freight house roofline created a covered platform to shelter freight workers during inclement weather. 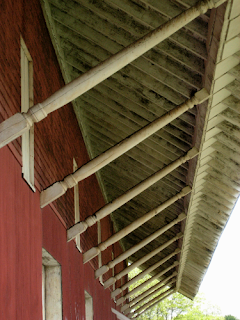 To support the roof fourteen turned posts were used, their design adding a degree of architectural detail lacking from most utilitarian structures of this type. Middleborough, Massachusetts. 1889. (detail). Boston: O. H. Bailay, 1889. In 1889, a second pictorial map of Middleborough was published, this time depicting the 1887 Old Colony Freight House just two years after its construction. It was, by far, the largest structure in the vicinity, its size an indication of Middleborough’s importance as a freight center. Today’s structure is little changed from that depicted over a century ago. Clearly visible are the six large bays which opened onto the freight platform. "Railway Station, Middleboro, Mass." (detail). New York: The Leighton & Valentine Co., c. 1900, lithochrome postcard. 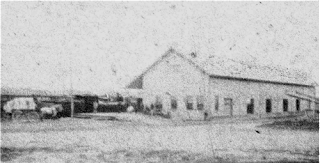 The relative situation of the Old Colony Freight House (the buff-colored building just right of center in this view) to both the Old Colony’s brick passenger depot (seen on the left), as well as the C. P. Washburn Grain Mill (above the boxcar) is clearly depicted in this view taken in the first decade of the 20th century. The earthen area surrounding both the freight house and passenger depot was notoriously muddy in wet weather, making teaming difficult in the area surrounding the freight house. Railyard, Middleborough, MA, photograph, c. 1900. This view of the southern portion of the Middleborough railyard clearly depicts the freight congestion that could be experienced there. In the middle distance, above the third boxcar from the left, can be seen the freight transfer station on either side of which are a cluster of freight box cars awaiting handling. Further in the distance, behind the second smokestack from the left, the roof of the 1887 freight house may be glimpsed. The passenger station is recognizable just beyond and to the right of the transfer station. Plate 26, "Middleboro" (detail) from Atlas of Surveys: Plymouth County and the Town of Cohasset, Norfolk County, Mass. Np: The L. J. Richards Company, 1903. The 1903 map of Middleborough (with the town-owned Washburn site outlined in red), clearly shows the 1887 Old Colony Freight House. The structure on the present Washburn site on Center Avenue just north of the freight house is the Swift & Company cold storage warehouse. 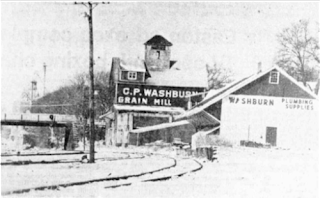 North of Center Avenue on the Washburn site appear the footprints of a long coal shed abutting the tracks and the C. P. Washburn Grain Mill at the intersection of Center and Cambridge Streets. The further development of the Middleborough rail yard since 1874 may be seen by comparing the maps of those two years. The large number of tracks in the Middleborough yard facilitated the sorting of freight. Walter L. Beals of Middleborough photographed the results of the November 5, 1906, collision in the Middleborough rail yard, a decided result of the heavy freight congestion the yard witnessed in the early years of the century. Here, the caboose of the first freight train has been pushed into and on top of the refrigerated car in front of it which was filled with cranberries, barrels of which may be seen at the front of the car. Though the photograph depicts what was clearly a devastating accident, it had actually been much worse. Beals photographed the scene only after the New Haven’s wrecker had removed the engine of the second train which had caused the accident. As early as 1932, the C. P. Washburn Company was making use of the former Old Colony Freight House to house a portion of its building supply business. The Company made minimal changes in the building, sheathing the south end of the structure, and closing off some of the former freight bays. The original appearance of the Old Colony Freight House is shown in these computerized architectural renderings. The building was a simple wood frame six-bay two-story gable-roofed structure. As such, it was typical of similar freight houses designed and constructed throughout the region during the latter half of the 19th century. What made the Middleborough freight house somewhat unique, however, was its large size, designed to accommodate the heavy freight business of the community. Freight would be received from trains which would draw along the freight platform. Freight agents would be responsible for receipt of goods which would be conveyed to their ultimate destination by local teamsters. The depot freight contract was a lucrative proposition for which local teamsters would vie with one another. 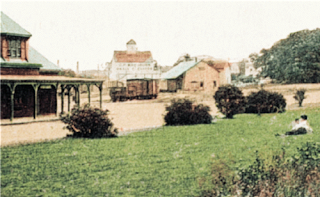 Goods shipped through the freight house including manufactured goods such as straw hats, woolen cloth, bricks, varnish and shoes; agricultural produce such as milk, cranberries, lumber and potatoes, were also diligently handled by the freight agent and the yard master who was responsible for the organization of freight cars within the yard. The transference of goods between trains was conducted at the transfer station which was located between the tracks just southwest of the passenger depot. Massachusetts. Middleborough, MA: Middleborough Office of Economic and Community Development, May, 1999. Middleborough, Plymouth Co., Mass. New York: J. B. Beers & Company, 1874. George H. Walker & Company, 1879. Middleboro, Mass. 1881. Framingham, MA: E. H. Bigelow, 1881. Middleboro. New York: Sanborn Map & Publishing Co. Limited, August, 1885. Middleborough, Massachusetts, 1889. Boston: O. H. Bailay, 1889. Mass. N. p.: The L. J. Richards Co., 1903. Sanborn Map Company, March, 1906. Sanborn Map Company, January, 1912. County, Massachusetts. New York: Sanborn Map Company, January, 1925. County, Massachusetts: New Report, September, 1932. New York: Sanborn Map Company, September, 1932.
of the Town Officers of Middleborough, Mass., for the Year 1904. Middleborough: The Middleboro Gazette, 1905. Railroad from 1844 to the Present Time in Two Parts. Boston: Hager and Handy, n. d.
II. New Bedford, MA: Reynolds-DeWalt Printing, Inc., 1969. Houghton, Mifflin and Company, 1906.